David Medalla, one of the most internationally recognized Filipino artists, will stage a new iteration of A Stitch in Time. Conceptualized in 1968, this is the first of the artist’s critically lauded participatory works of art. It allows viewers a chance to collaborate in the piece by sewing a trace of themselves onto a huge swathe of canvas that will hang at the fair’s central exhibit space. A Stitch in Time has traveled the world, most notably to the 2017 Venice Biennale. It has, however, never enjoyed a Philippine run. LivVinluan is this year’s recipient of the Karen H. Montinola Selection, a grant given by the family in memory of a collector who championed works of emerging artists. Vinluan‘s work is called NungGamabalain Yung Sayawan/The Disruption of Dance. 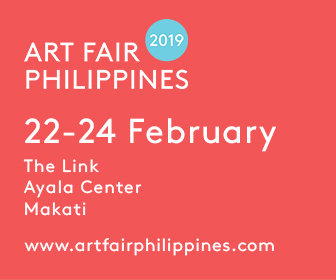 Other artists for ArtFair/PH Projects are Ryan Villamael (Behold a City), OcaVillamiel (Cheap Medicine), Ian Fabro (Inferno, Purgatorio, Paradiso), Christina QuisumbingRamilo (Forest for the Trees), Olivia d’Aboville (Everything, Everywhere, Everyone), and MM Yu (Subject/Object). The participating galleries in Art Fair Philippines 2019 are: 1335MABINI, Asian Cultural Council/León Gallery, Affinity Art, Altro Mondo Arte Contemporanea, Archivo 1984, Art Cube, Art Underground, Art Verite, Artemis Art, Artery Art Space, Artinformal, Avellana Art Gallery, Blanc, Botero in Asia, Boston Art Gallery, CANVAS, CLEAR Gallery Tokyo, District Gallery, EdouardMalingue Gallery, Eskinita Art Gallery, Finale Art File, Gajah Gallery, Galerie Roberto, Galerie Stephanie, Galleria Duemila, Gallery Kogure, Gallery Orange, J Studio, Kaida Contemporary, Kobayashi Gallery, La Lanta Fine Arts, Mind Set Art Center, MO_Space, Nunu Fine Art, Paseo Art Gallery, PINTÔ ART GALLERY, Salcedo Auctions, Secret Fresh, Shukado, Silverlens, Soka Art, TAKSU, The Crucible, The Drawing Room, Tin-aw gallery, Underground, Vin Gallery, Vinyl on Vinyl, West Gallery, Yavuz Gallery, YOD Gallery, and Ysobel Art Gallery. This year, the fair, in partnership with National Bookstore, is proud to welcome art historian Kathy Galitz from the Metropolitan Museum of Art in New York. A specialist on late eighteenth- and nineteenth-century French art, Galitz launched her book,Masterpiece Paintings at The Metropolitan Museum of Art, which celebrates the most important works and the most iconic paintings in The Met collection. She will share her extensive knowledge and insights with local art enthusiasts and her book will be available at the fair.